I'm no expert on HOW 3D printing is done, and I can take your word that the "skills" used to design and print a bust are on a par with someone who takes a lump of clay and then shapes it by hand. But, I bet you're going to have a hell of a tough time selling that to the public and to sculptors! This is the same battle that brush artists have to wage with computer designed and printed art in the larger "art" community. You may be right, but I can see IPMSUSA being hurt by this if it's pursued. Once more...I'm of the opinion that IPMSUSA needs to be as inclusive as possible, within reason, for people who do what WE do. However, being inclusive JUST to add memberships and dues is not a direction I think we should go. I just draw the line a lot closer to where we are now as opposed to many others! Gil, I had a friend...Tony Weddel...who was a professional aviation artist. We never discussed the subject at hand since he spent the last eight years of his life in a nursing home. BUT he did play around with computer art and produced some very good art that was essentially indistinguishable from that done with a brush on various media. Both would've been recognized for what they were and perhaps that would be a solution to the question of 3-D printed busts vs hand sculpted and cast in resin busts. They each have their strengths and weaknesses, so acknowledging those differences with separate categories might be the way to go. Interesting discussion! For those who will be in Phoenix next week and have some time to kill on Thursday afternoon, I'll be giving a seminar on 3D Printing. The focus is an overview of the different types of 3D Printing (technology that is used) and how it relates to scale modeling. Basically, I'll be covering the basics! I am in the 3D printing industry and also teach a course at SUNY on 3D printing technology. Some of the confusion comes from the different ways 3D Printing can be used (make individual parts or the complete model). Being deeply embedded in the industry, I am not too concerned that there is a problem yet with 3D Printing and IPMS contests. Hopefully, I'll be able to answer any questions on this topic on Thursday! It could be argued that drawing up parts on a computer and downloading them to a 3D printer is draughtsmanship rather than craftsmanship. Hmm-m-m. Semantics have finally made their appearance. Draftsmanship is defined as "the art or craft of a draftsman/the skill of drawing." Craftsmanship is defined as "the quality of being a craftsman/an example of a craftsman's work." Whatever the work or media used, anyone who creates a product...whether a painting, sculpture, scale model, 3D print, ceramic bowl, silver jewelry or whatever...using developed skill is a craftsman. Whether or not you want to qualify a model created from 3D printed parts for inclusion in an IPMS contest is a totally different thing. But the person who creates the file that controls a 3D printer that then produces the part is still a Craftsman. I worked as an CAD CAM engineer for a large part of my working life. so by definition, craftsmanship depends on how you look at it. Although I look at the work I was doing as being highly skilled, when I go to a craft fair and see jewellers beating shapes from silver ingots into sets of spoons, or someone doing an intricate wood carving or making a violin by hand, I am in awe of the craftsmanship that they have developed through years of experience working on raw materials by hand. 3D printed model kits/ parts...….Technically a plastic, Should be eligible for IPMS comps just like resin kits and bits. Funny thing though. What do you make of say a 1/72 scale fighter kit retro fitted with Aeroclub white metal engine, propeller, under carriage and Airwaves photo etched cockpit interior details? Does this comply with IPMS USA rules considering the percentage amount of metal use to plastic in the model? I know much of this sort of stuff is done in resin these days so the question is probably a bit hypothetical but would be interesting to know. IPMS/USA no longer has a plastic content rule. My take on 3D parts is that they are, at best, scratchbuilt parts (if the user is also the person who made the CAD file, whether they actually own the printer themselves or went through an outlet such as Shapeways to have them printed) and at worst, aftermarket parts in the same realm as resin, white metal, or limited run plastic parts. Interests:32nd and 48th Jets and some WW2 props. 350th Ships and 35th scale armor with some F1 cars thrown in for good measure. There is a difference between parts and the whole kit. I think we go down the slippery slope if we allow whole kits that are printed and already fully constructed right off the printer. Parts are different in that you are adding them as in aftermarket parts for conversions/updates ect. A whole printed model is (For me) much different. The problem with this isn't whether or not it's a part of our hobby, it's how to handle 3D printed items in a contest. I agree with Jim in that currently "3D parts" are like any other parts for a model. They can be judged on how well they are painted and assembled for the MOST part. However, even there, you can start getting into some gray areas....what if flexible "individual link" (working) tank tracks are produced? What if you can't tell at a glance between them and actual individual linked tracks that HAD to be assembled? If the builder denotes which is which, then judges CAN make a determination on which one is "better crafted" by the BUILDER on the model. But what if they don't? This is ALL about how to judge these things. We're a group of people who take plastic kits consisting of many parts and assemble them and paint them into (usually) as authentic a replica as within our skill set allows us to. The degree of craftsmanship displayed in successfully doing that determines who wins what. The more something is done FOR us, the less individual craftsmanship on the part of the MODEL BUILDER is involved. As long as those differences are noted by the builder, the judges have a chance to make a determination on them. What happens if the builder stops denoting what's used AND they become indistinguishable? My concern with 3D printing is that we will cave to including a lot of items that severely lessen the need for craftsmanship on the part of the builder. At this time, that's just "parts", and we can certainly adjust to and handle those. But, 3D printing is in its infancy right now....by the time it's matured I see it as becoming the new "die cast" model. If we open the door for 3D now, especially FULL models, it might become very difficult to close that door in the future.
" I think we go down the slippery slope if we allow whole kits that are printed and already fully constructed right off the printer." We are still discussing semantics (assembling). What real difference does it make that the modeler assembles their model in the computer or by hand? Everything is still made, designed AND assembled by the modeler, and believe it or not, there are a number of skills and difficult potential problems associated with printing a fully assembled model in the computer (i.e. undercuts, wall thickness, etc). Rest assured it's not easier. The more complicated the project, the more difficult printing a one piece, fully assembled model is along with countless places to err. 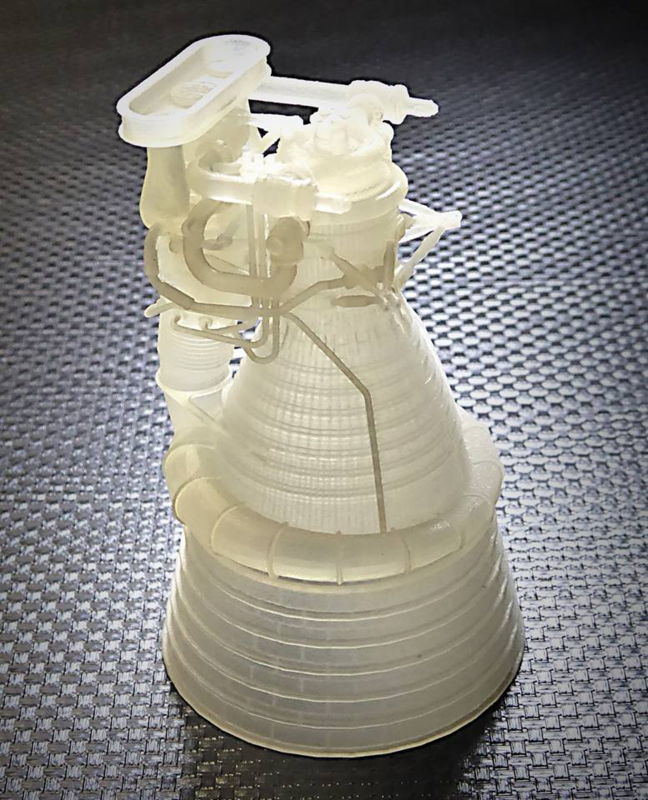 You're going to tell me that the modeler that uses and simply PAINTS the 3D rocket engine bell assembly above is not using less craftsmanship than the builder who only has the basic kit supplied bell and has to add/scratchbuild the other parts to equal the look? What chance did the 3D "builder" have at leaving glue marks when adding the piping? For that matter, did the 3D builder actually draw all those details, or did he scan in a few pics from different angles that his software then replicated for the printing? How would THAT compare to even having to make and replicate that same detail in OTHER materials that are added to that bell by HAND? The WHOLE point to 3D printing, whether it's a part or a whole model, is to be able to do such things as the above in one piece, and in better scale, so that a PURCHASER/builder doesn't have to. You cannot convince me that having and adding such parts to our models in an IPMS contest will not have an impact on the judging, and more importantly, how FAIRNESS is maintained as we move forward. The problem is that at some point these parts, especially if not handled correctly by IPMSUSA, might impart an unfair advantage to some users. IPMSUSA needs to try to avoid even the appearance of such a thing, let alone the reality. We're NOT a society of computer designers, we're model builders. Whatever "design difficulties" a designer like yourself may have to overcome is just the same as those any model manufacturer has to overcome when they "up" their plastic kit technology. It has NO bearing on how well we BUILD our models, which is what we judge. You're giving way too much credit. I doubt seriously (though I don't know for sure) a scanner was used to produce the 2" high model you see above unless the modeler had access to VERY expensive scanner equipment AND had a scale master to scan from. The question to be asked would be how many hours of skill and prep work went into entering the information into the computer. Even them I doubt VERY seriously the model above was produced in one session on the printer. Like any other model, the many parts you see were probably manufactured separately, then assembled. I say probably, because I have no idea (just a working knowledge of 3D printing and drafting) exactly how it was constructed. I am aware we are not a society of computer designers, but every day more of us modelers join those ranks to produce the parts we need for our projects as accurately as possible. You may as well get used to that. Like it or not, computers as modeler's tools are here to stay and our society needs to address this. I don't think many of us would have a problem with someone adding a custom printed part. In a way that is what we do when we add aftermarket resin. Only difference being someone else scratch built it or designed it to replicate it en mass for the consumers. So you're scratch-building with a printer. I do see though where the argument could be made that the skill necessary to design and print that part are vastly different than what we did in the past and continue to do by scratch building. It's virtual modeling that is then brought into the physical world via the printer. So the question begs, are we virtual modelers and if so then I would argue what we do is dead. We assemble plastic , finish it, paint it ect. Those are vastly different skills than sitting behind a keyboard to then only hit a print button. An analogy if I may. You paint a portrait on canvas with paint. Or do you paint a picture on a computer screen and hit the print button. In reality thats two different things since it's two vastly different mediums being used to get to the picture. If and when full models are becoming the norm then I would assume a category would be created to enter them in just like vac form and scratch-built's have their own categories. Construction wouldn't be an issue since it's all ready built by the printer. Really the only thing you could look at is paint application. Er, how would you be able to paint all the interior details of a fully made model from a 3D printer? Kits and bits would be the way 3D printers would be any use to us plastic modellers in the future.
" You paint a portrait on canvas with paint. Or do you paint a picture on a computer screen and hit the print button. In reality thats two different things since it's two vastly different mediums being used to get to the picture. " Sorry. I disagree. Using your analogy, Stephen King is in a different class of author unless he writes all his books by hand on paper. The same analogy applies to a draftsman unless they draw all the drawings by hand on paper rather than print them out. Both are the results of advancements in their fields of endeavor. There are many differing opinions on the use of 3D printing in our particular realm, so it is very much a matter of each to their own views at present. I expect that things will settle down sometime soon when IPMS USA finally makes a decision about what way forward to go when more and more people use this technology. Hasn't been discussed much by IPMS over here in the UK so I guess that we will probably take a fairly pragmatic approach to this subject. My take on this is that as the process of developing 3D drawings and also that 3D printing is comparatively slow, end users (model builders) will find it very expensive compared to buying injection moulded kits that we are all used to. This thread has been fascinating and has pretty well covered the full range of problems and solutions involving modelbuilding and 3D printing. But I would suggest that none of us have touched on the true root of creativity. That root is the MIND. Or if you prefer, the SOUL. Think about it: No scale model, full size aircraft or machine, floor plan, etc, literally anything that has ever been constructed in a hard, physical form would exist if it had not been originally CREATED within the mind of the individual who constructed the first physical example of that CREATION. Yes, creativity is everywhere, especially within what is known as the creative arts. But the initial spark...call it the Big Bang Of Your Mind if you wish...that triggers the original CREATION (the "Hey! I just got an idea!" thought), occurs within the MIND and nowhere else. Jim, I agree with you that the solution to the 3D 'problem' with IPMS/USA will be separate categories. And Rusty, I agree with your last comments. Stephen King is as much an author as Ernest Hemmingway, even though Steven King uses a typewriter. Heck, he might even use software that allows him to talk his writing into a computer without touching a keyboard. Keep in mind that Hemmingway refused to use a manual typewriter. Instead, he sent handwritten tablets to his publisher who had hired a woman whose sole job was to turn his handwritten manuscripts into typewritten form. Oops! I just realized something. I write articles and books on a computer so that a computer can tell a printer how to print my articles and books. So who's the writer...me or the printer? The computer and the printer are just tools! The printer just prints and the computer just follows you (the writer's) instructions. That time may be closer than you think. With the rapid development in driverless cars and AI, we may be judging models of driverless cars before long. Having observed the discussion here I would like to add a couple of observations. The discussion seems to be skirting the issue of a definition of “scratch built”. We all know that a part or model created from raw materials and crafted entirely by manual tools is scratch building. The question seems to lie in the gray areas of adding computers or other methods to the mix. It is scratch building to make one part and then resin cast it to make duplicates, perhaps like suspension parts on a tank? Is it scratch building to take a kit part and modify it into a different part? What if you do that to correct a flaw in a kit and then resin cast the part to make enough for a whole model? How different would it be instead of modifying a part, you 3D print a part and then resin cast it. A lot of commercial resin casters use 3D printing to make a master and the resin cast it. Much cheaper than 3D printing a bunch of the same part. Now another though. Instead of 3D printing the part, how about machining the part out of metal. Most would say that is “scratch building” but does that change if you add a computer driven mill or lathe? To the point, Sherline sells computer driven mills and lathes that are about the same cost as a good 3D printer, so the point is still relevant. Does it matter that the builder is working in metal vs. thermoplastic? Or is it a matter that machining metal requires additional knowledge of feed rates and depth of cuts and types of metal? Would you have the same answer if the material being machined was Delrin(a DuPont machinable resin) Both 3D printing and CAM machining use similar programs to create their files, but is it enough different to segregate it at a model contest. I will speculate that Scratch building is a very nebulous term that has outlived its usefulness. Perhaps hand crafted would be more appropriate since it implies a degree of manual dexterity we are trying to define. This would include the use of power tools guided by the hand of a master, not by a computer. If I were to put on my Nostradamus hat and peer into the future, I can see a modeling world without injection molding. Hobby shops (or online stores) would have high definition 3D printers and a stack of boxes. The “Model” companies would own and lease files for models that could be printed in the store on demand and model companies would receive a commission for every model printed. This would reduce the cost of a model precipitously. No shipping cost, no warehouses to contend with. It would also allow the companies to create multiple variations at little or no cost so you could have your Messer-Wolf 125c auft 34 for the desert campaign of the 5th panzers. We are moving that direction rather rapidly, so will that eliminate “scratch building” or will we have limited the category to a select few? Pete, you have expounded on a very important point, which is that technology is changing at a breakneck pace...or at warp speed if you prefer. Some things that we considered state of the art 12 - 18 months ago are now obsolete. If you recall the Star Trek:The Next Generation series...and I would think you are a serious science fiction enthusiast...we may not be that far from some version of their replicator that created everything from food to clothes to violins...remember Picard's Tea, Earl Gray, Hot and Data's Stradivarius Violin...by the individual doing nothing more than speaking their desire into thin air and the replicator manufacturing it from basic atoms. In some ways we're tilting at windmills, much as Don Quixote did. But the bottom line is that we have to figure out a way to handle all these new developments in a way that we find acceptable. By the way, back in the late 60s, early 70s, I was one of the first to produce resin aftermarket components. Back then, the masters were hand made from wood, RTV was poured over them to create a mold, then resin was poured into the cured mold by hand to produce a finished part that could be sold. The first resin products I ever made were underwing tanks for the 1/32 Revell F4J. Back then they were state of the art. Today no one would want them due to the lack of surface detail compared to what is available today. The classes at the USA nationals and SMS Telford out of necessity have to reviewed and changed from time to time. Sometimes it is forced by developments in technology that has to be embraced. Sometimes it is due to the amount of support (or lack of) for that class on the table. A good example is that over recent years I have been scratch building classic cars and there was a class in civilian vehicles for this. Not many scratch builds were entered over the years and scratch builds have now been grouped with detailed kits such as the stuff from Model Factory Hiro and Tamiya used as the basis instead of making all the parts yourself. Although from my point of view this decision was a tough one as going up against detailed kits will be difficult, I can understand the rationale behind it. If you want examples of scratchbuilt models that took top honors at the IPMS Nationals 30 years or so ago, how about a YB-49 in 1/72 scale, entirely from sheet styrene? Today it wouldn't stand a chance. Tools, rule changes and technology marches on.